April moved really quickly over here at SBAI, especially because we were involved in many new LGBTQI Awareness Month initiatives. We’d like to thank everyone who came to see an Out in Reel film, joined us for Kathleen Casey’s Keynote lecture at the Undergraduate Conference, or co-sponsored one of the many other LGBTQI events with us in April. University of Rochester KEY Scholar Andrew Moran has been working on updating the UR Safe Zone program, which was historically a student-led program that trained interested participants on LGBTQ issues. Participants who completed the training received the Safe Zone decal, which are typically found outside an office to mark that the office is a “safe zone” for LGBTQ folks and their allies. Our recent blog post includes some more information about other LGBTQI initiatives Moran is leading here on campus. The purpose of Safe Space is to reduce homophobia and heterosexism, making our campus a safer and freer environment for all members of our community regardless of sexual orientation or gender identity/expression. The goal of the training is to provide you with information about how to provide safe spaces for LGBTQ & Allied people regarding these issues, with the idea that you will be interested in displaying a Safe Space sticker or decal in your office (this only identifies the individual’s area is a Safe Space, not their entire department). The sticker simply signifies you are open to questions from and about lesbian, gay, bisexual, and transgender (LGBT) people and the issues that concern this community. 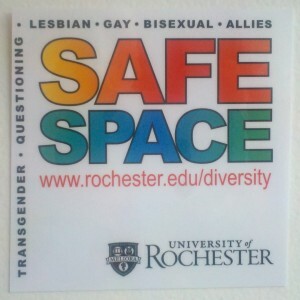 The University of Rochester publication Currents recently published some more information about Safe Space, found here. And now for the special announcement – guess what came in the mail recently? – my new Safe Space decal! Of course, the entire Susan B. Anthony Institute is a Safe Zone and will continue to be, but I was really thrilled to get the decal and be able to display it on my desk. Check it out! LGBTQI Awareness Month may be officially over, but please continue to check in here for more of our ongoing events and future plans! This entry was posted in Announcements and tagged #LGBTQIawarenessmonth, #safespace, #safezone. Bookmark the permalink.